Do You Need An Implant Bridge? Have you lost one or more teeth? A missing tooth can lead to a number of complications, ranging from misalignment to loss of jawbone density. In order to enjoy a whole smile and avoid serious complications you need a dental prosthetic. Do you need an implant bridge? How does placement work? Question: When does the doctor recommend a bridge? Answer: We may suggest one to replace one to three missing teeth, provided they are in a row. We use them to address minor tooth loss. Question: How does an implant version differ? Answer: Traditional prosthetics are held in place with dental crowns. The crowns are attached to the artificial teeth and placed onto the natural teeth on each side of the gap in the smile. However, with the implant version, implant posts are inserted into the jawbone, securing the new teeth without requiring surrounding teeth to lose structure. In addition to preventing misalignment, the posts stimulate jawbone growth, preventing loss of jawbone density. 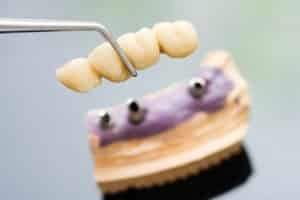 Question: Who qualifies for an implant-supported dental bridge? Answer: The patient will need to have enough jawbone tissue to support the new tooth. Otherwise, we refer him/her to a specialist to receive a bone grafting procedure. After the grafting procedure, the patient’s jawbone can then receive a dental implant. Question: How long will my new tooth/teeth last? Answer: Crown and bridges last between 10 and 15 years. However, the implant alternative can last for several decades, often a lifetime. You will need to care for them as you would your natural teeth, brushing and flossing daily and having your teeth professionally cleaned once every six months. If you have any questions about our implant bridges then please contact our office today.